You’ve read about it on your favorite blogs and websites. You watched the crazy teaser videos that ripped off the Brad Pitt flick Seven. You downloaded the free MP3s. Now it’s time to wipe away the drool, because the Meth, Ghost & Rae collabo album is coming out. 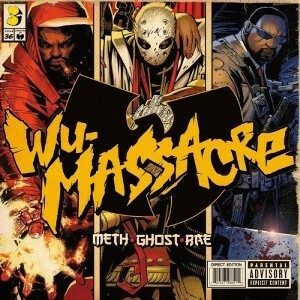 Set for release via Def Jam on March 30, Wu Massacre is mostly a Wu affair, with production from RZA and Allah Mathematics and guest spots from Inspectah Deck, Streetlife (Remember “PLO Style?”) and Trife. Interestingly, the Rhythm Roots Allstars, who were the backing band on many of those Scion Live mini-tours from a few years ago, and even showed up on Ghost’s The Big Doe Rehab, contribute to a few tracks. Here’s what the label is calling the “tentative” track listing. I will update it if there are any changes. This entry was posted in News and tagged Def Jam, Ghostface Killah, Method Man, Raekwon. Bookmark the permalink. Hear Digem﻿ Tracks (Gunshowers) on the new Meth Rae Ghost album entitled “Wu Massacre” coming March 30th 2010 on Island/Def Jam Records ! !